~Somehow my friends Kathy, Cheryl and Manise convinced me to sign up for the 2007 Massachusetts Race for the Cure. Our team is called “Spun and Run” but you can be sure I’ll be walking not running. It takes place on September 23rd and finding a cure for breast cancer, while not as near and dear to my heart as finding a cure for colon cancer, is still something that would be incredible for all women. If you’d like to support me by making a donation click here. Thanks so much! ~I signed up for One Local Summer and participating fully has been much harder than I thought it would be. 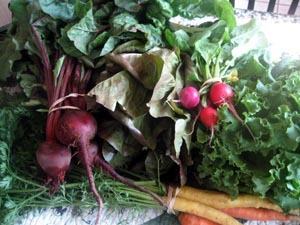 The CSA has really helped with procuring local vegetables and eggs but pulling together an entirely local meal is truly difficult. We’ve had several mostly local meals over the last few weeks but I’ve yet to make a meal that is entirely local. Hopefully you’ll see one here soon. ~Anyone need anything from Pampered Chef? I had a party last night and am trying to get up to the next level with an outside order or two. If you’d like to order anything please email me at cjuliusATcarverplDOTorg and I’ll take care of it for you. ~I don’t want to give you too much information on my Tour de Fleece participation since the contest is open until the tour ends but I will tell you that I’ve spun about what I thought I would have by this point. Can I just say, though? Some of you are really optimistic about my spinning capabilities! 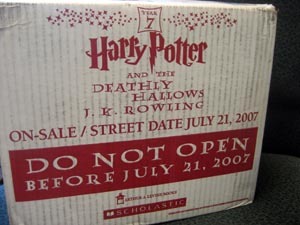 ~Ten copies of Harry Potter and the Deathly Hallows arrived yesterday and will be sitting in my office unopened until July 21, 2007. Now that’s willpower, my friends. I couldn’t do it. Good thing I don’t work in a bookstore or library. I will tell you right now that I would not have the willpower. Not for five minutes. I’m sure this reflects poorly upon me, but it’s the truth (so maybe my honesty counteracts my lack of self-discipline in some way? ).